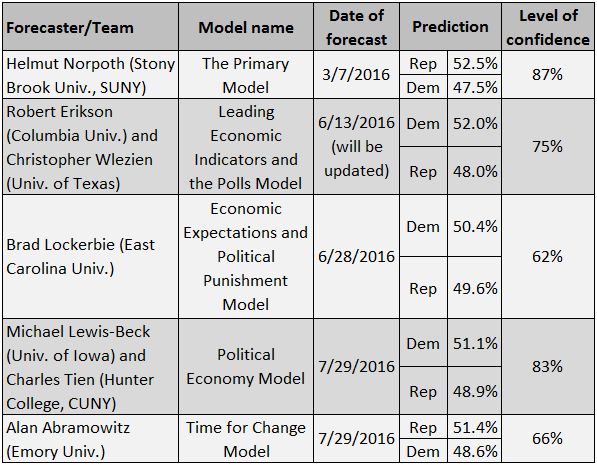 Dear Readers: This is the latest in a series 1 of political science forecasts 2 for the 2016 races for the White House and Congress. We'll be featuring forecasts from nine different individuals and/or teams this year, which James E. Campbell 3 is assembling as part of a project for PS: Political Science and Politics that we are also featuring in the Crystal Ball. These models are based on factors such as the state of the economy, polling, whether an incumbent president is running for reelection, and other indicators. They can often be a better predictor of the eventual results than polls alone, and many are finalized months before the election. We are pleased to feature the work of the many top political scientists who have built these models, both in an attempt to predict the outcome of the election and, more importantly, to identify the factors that actually affect presidential races. 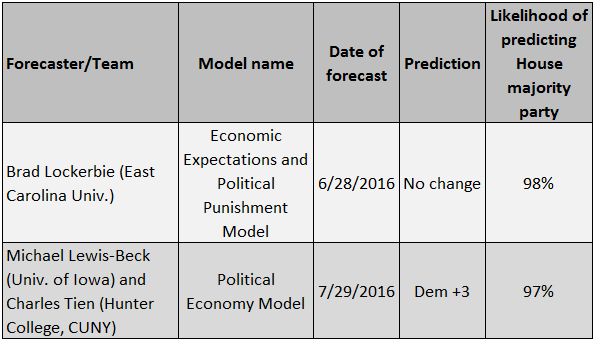 The two sets of forecasts below feature outlooks for both the presidential and U.S. House of Representatives. As we feature new models, we will update Tables 1 and 2 to provide a running tally of these forecasts. Description: Before the candidates are formally nominated, we have a fairly good idea of which party will win the upcoming election. People's expectations of the state of their personal financial well-being are expected to influence the outcome of the election. The more negative the electorate is about the future, the more likely the incumbent party will do poorly. Also, the longer a party has controlled the White House, the more likely they will have accumulated discontent from the electorate. Consequently, the longer a party has had the White House, the more likely it will lose. This model forecasts the outcome of the popular vote accurately for all but two elections since 1956. For the House model, we also need to consider the incumbency advantage. Predictors: Logged 4 time in the White House for a party and second quarter negative expectations for one's financial situation taken from the second quarter of the presidential election as presented in Table 8 of the Survey of Consumer Attitudes and Behavior 5. For the House model, I add in an interaction item that accounts for the number of open seats and whether the election year is good for a party. By definition, midterms are taken to be good for the party in opposition to the president. On-year elections are considered neutral unless one party is overwhelmingly expected to be victorious. The Forecasts: For president, 50.4% of the two-party vote for the Democratic presidential candidate. For the House, 0 seat change. Both forecasts were made on June 28, 2016. Predictors: For the presidential forecast: 1) Political Popularity = Gallup Presidential Approval measure in July of the election year, 2) Economic Growth = the GNP growth in the first two quarters of the election year. For the House forecast: 1) Political Popularity = the job approval rating for the president in the June Gallup Poll, 2) Economic Conditions = growth rate of real disposable income over the first two quarters of the election year, 3) Midterm Status = 0 for presidential election years and = 1 for midterm election years. 4). Seats exposed = number of seats the president's party has up for reelection. The Forecasts: For president, 51.1% of the two-party vote for the incumbent presidential party. For the House, a three-seat gain for the president's party. Both forecasts were made on July 29, 2016.